The Dakar Rally draws closer for Monster Energy Honda Team with the loading of the vehicles in the port of Le Havre. The ship transporting all the team’s equipment is bound for the port of Lima and is due to arrive in a month’s time. 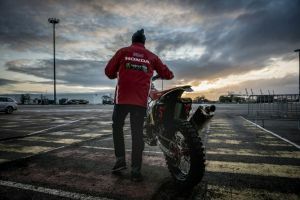 With the details of the 40th edition of the Dakar Rally now known, Monster Energy Honda Team have progressed to the following stage of preparations: the embarkation of the team vehicles set to participate in the rally. Successfully aboard and shortly bound for the South American port of Lima, the team will now have to wait until January 2 to pick them up. The next phase will consist of overcoming the final administrative and technical checks in the Las Palmas Air Base on January 4 ahead of the official race start from the Peruvian capital on January 6. The task of boarding the vehicles involved, among other things, checking that all equipment were fitted with the obligatory safety devices such as towing cable, flashlights or glass-breaking hammers, fire extinguishers and other such elements. Likewise, vehicle documents such as the technical sheets or insurance papers were scrutinized and the detailed inventory of all the vehicle contents were checked. The ships are scheduled to depart from the port of Le Havre next Monday and will arrive at the port of Lima, Peru as 2017 draws to a close, after a month at sea on a journey which passes through the Panama Canal.